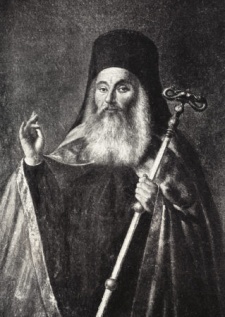 Agathangelus (Greek: Αγαθάγγελος) was Ecumenical Patriarch of Constantinople during the period 1826-1830. He was born in a village near Edirne, which helped to accuse him of being of Bulgarian descent. There he was first educated. He became a monk in the Iviron Monastery of Mount Athos. About 1800 he became priest of the Greek community of Moscow. On November 1815 he was elected Metropolitan bishop of Belgrade and on August 1825 metropolitan bishop of Chalcedon. In the 26th of September in 1826, after Chrysanthus of Constantinople was deposed and exiled, Agathangelus was elected Patriarch of Constantinople. He was one of the most educated Patriarchs of his time. He spoke Greek, Turkish, Bulgarian, Russian and French. His reign was associated with certain actions which lowered his prestige and caused heated reactions. The first was his involvement in the Greek War of Independence in 1827, when some of the chieftains of Central Greece asked for his intercession with Sultan Mahmud II so that they would be amnestied. Agathangelus, on the Sultan's order, sent a deputation to the Ioannis Kapodistrias, asking that the Greeks submit tot he Sultan, an act which tainted his reputation as anti-ethnic. Along with his involvement in the election of the Patriarch of Jerusalem, which was attributed to bribe, and economical and administrative instabilities, led to his deposition on 5 July 1830. After that he was exiled to Kayseri and later to Edirne, where he died in 1832. This page was last edited on May 13, 2016, at 20:07.